I am a professional landscape painter working in watercolour and acrylics. Many of my subjects are sought amongst the moors and hills of my native West Yorkshire and beyond. Throughout my painting life I have been made a Companion of the International Guild of Artists, an Associate of the British Watercolour Society, a Professional Associate and advisory panellist of the SAA, president of the Halifax Art Society, as well as an advisory panellist for Artists and Illustrators magazine. In 2013 I won the Pennine Wealth Management Award for ‘Best in Show’ at Holmfirth Artweek and exhibited my work in the Sunday Times Watercolour Competition. I regularly contribute to The Artist magazine and have four practical art books published to date. I have been teaching and lecturing on the subject of watercolour and acrylic painting for the last fifteen years. Originally a watercolour artist, having the time to devote full time to painting he began to see the exciting potential that other media could offer and now regularly works in acrylics, line and wash, water soluble oils and mixed media. Watercolour landscapes to die for! It’s my passion to pass on my knowledge and skills that I’ve learned over the years as I love watch others achieve what they thought was too difficult. I hope to inspire the world to get a little mucky with a heck of a lot of colour. Pattern, colour and natural form are the focus for my floral watercolours. Inspiration is sparked by the colours and shapes of flowers, gorgeous fabric, a special jug or vase. The contrast of natural form with geometric pattern is often a strong element in my work. I aim to produce a response in my painting that is fresh and contemporary, not merely a faithful reproduction and am inspired by the information set out before me to produce a spontaneous reaction. It is an exciting journey which I hope helps to keep my painting alive with fresh, vibrant colour. This is a pay on the door event, £2 for members and £5 for non members, just turn up! £4 for non members, toilets on site. 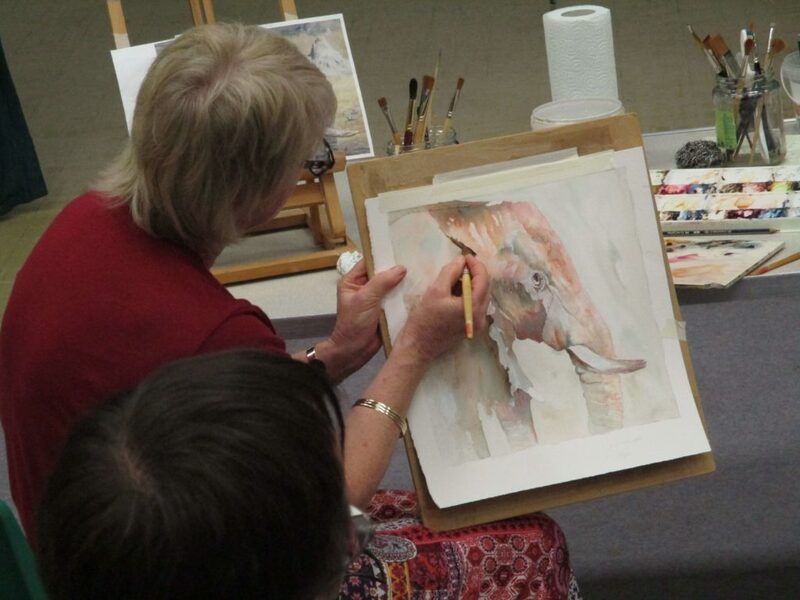 Here are some spectacular photos from our recent demonstration from watercolour artist Jenny Neale. On 28th March we once again took pleasure in welcoming back Tim Rose who recreated a truly wonderful street scene from San Francisco in two stunning hours using watercolours. Tim has the unique ability to bring a scene to life with some deft brush strokes whilst at the same time talking through his subject in a most engaging style whilst giving some most helpful tips on making the best use of light and dark. Tim also showed us how to effectively use Saunders rough high white paper which he was trying out for the first time on the night! His demonstration involved minimal drawing with paint (manganese blue) applied straight to paper without a lot of water. He used a fairly restricted palette of colours too working quickly to capture the essence of the subject but not slavishly copying it! His tips were many and included looking at where the light was coming from and the contrasts light created. He used Soft blue for the San Francisco sky and Naples Yellow to great effect. “Paint with the lights and draw with the darks” he said. Altogether it was yet again an inspiring and most interesting demonstration by a craftsman who knows his subject both inside and out and so well done Tim for a truly great evening! Author adminPosted on April 27, 2017 Categories Demonstrations, NewsTags Tim Rose, watercolourLeave a comment on Welcome back Time Rose!